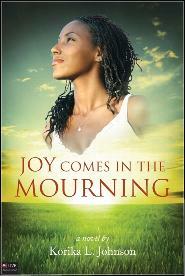 Joy Comes in the Mourning by Korika L. Johnson is a refreshing book about you and your relationship with GOD. This book warms your heart with the life siutations that are going on and how we deal with them. Joy Comes in the Mourning is about family, love, friendship, death, life, illness, forgiveness and finally acceptance. There are so many things about this book that anyone would love, not just the person who loves christian novels but just a person who has gone through trials and tribulations and feels like there is no hope, this book while giving you a story, shows you step by step how to find everything that you need to do in order to restore hope when there seems to be no hope. There are many scripture references in here that will help you see through the situation that is going on in the book and make you understand how the resolution came about. Joy Comes In The Mourning is an excellent bookclub book because you will have so much to discuss about this book and it is the type of book that you could very well re-read . While you are reading this book, you will definately apply some of the situations to your own life and it is giving you the resources to resolving your issues. This is my first experience with Korika L. Johnson and I will continue to read her works! Great book, great job, excellent reading! Joy Comes In The Mourning is available through Amazon.com in both paperback and Kindle. This entry was posted in Christian Fiction and tagged Book Reviews, Joy Comes In the Mourning, Korika L. Johnson, misscsolo, Tate Publishing. Bookmark the permalink.